The American crocodile is one of only two crocodilians in North America, the other being the American alligator. The American crocodile or Crocodylus acutus, grows to a maximum size of 13 feet in length and is less confrontational than its larger cousins in Australia and Africa. The state of Florida is as far north as the Florida crocodile is found, although its range reaches as far south as the coastal jungles of Central and South America. The American crocodile is similar to other crocodiles found around the world in that it will eat whatever it encounters. The size of a crocodile's prey will tend to depend on the size of the crocodile. For example, young crocodiles will eat insects, shellfish, snails and fish since they are small enough to manage and readily available in a watery environment. 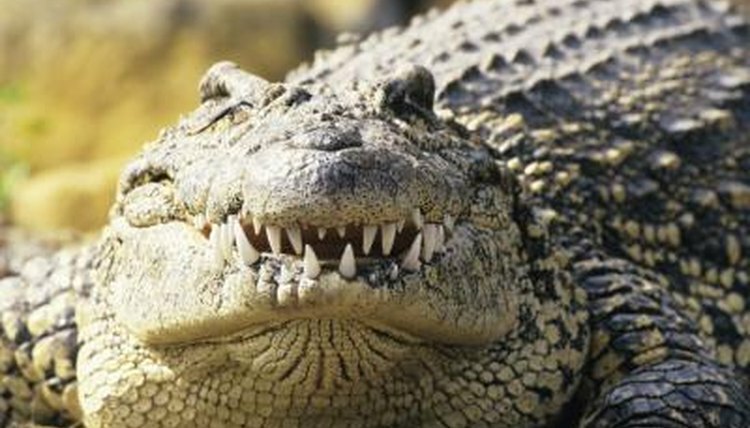 Full grown crocodiles will eat snakes, turtles, birds small mammals and larger fish since they are able to catch and digest more substantial meals. Florida crocodiles are also known to scavenge dead animal carcasses when available. The amount of food a crocodile eats, along with the temperature of its environment directly influence its size. Since Florida is at the northern limit of the crocodile range, crocs there are smaller in size than those in equatorial regions. Crocodiles hunt along the edges of swamps, rivers and canals where unsuspecting animals and birds come to drink and feed. They use stealth to approach their prey then trap it in their jaws and drag it into the water where it is drowned and eaten. Crocodiles are also common to the brackish waters of Southern Florida where the sea meets inland freshwater bodies. In many cases, Florida crocodiles are fed by humans either directly or indirectly. In the Florida Keys for instance, many people come to fish in the coastal waters using chum to attract the catch. Crocodiles are instead drawn to this food source and may begin to associate it with the boats and humans who supply it. This can be a dangerous development. Crocodiles are also known to frequent the backyards of homes that abut against waterways since they may find garbage or other food sources including pets that make for an easier meal than hunting. Florida crocodiles do most of their hunting and eating at night. Darkness offers crocodiles natural cover and makes the element of surprise all that more effective. Like most opportunist hunter, Florida crocodiles will hunt during the day if their food supply is more accessible during that time or if the potential for an easy meal arises.